On February 3, 2013, Craig Fisher, a blogger for the Western Springs Patch, devoted his weekly column to the ongoing tragedy at Timber Trails. We reprint his post by permission. older. I’ve included a photo I took of the trunks being shipped out (below) and you can see how large – how ancient – these trees were. So what occasioned the destruction of another 29 trees? I’m told that the site owners need to run drainage pipe to the eventual retention pond down near Plainfield and the Toll Road. It was a painful thing to watch. An official tree survey in December 2004 found that there were 1157 trees onsite with a diameter of 12" or more (measured 4' above the ground). Of those trees, 710 were oaks (including 463 burr oaks) and 36 were shagbark hickories. The various oaks and shagbark hickories represented two-thirds of the large trees on site. Using the Morton Arboretum’s handy table, we can estimate the age of the smallest (i.e. 1 ft in diameter) burr oaks as 79 years old and the shagbark hickories as 116, while red and white oaks fall between these two in age. That is, in 2004 Timber Trails had over 1100 trees that were 80 years of age or older. The trunks of ancient oaks are summarily hauled away. It has so far proved impossible for me to discover how many of the original 1157 trees have been destroyed. And how many is too many? Is it okay if “just” 300 of these old trees are destroyed? Or perhaps destroying 500 of the at-least-80-year-old trees is fine and dandy. Do I hear 600? 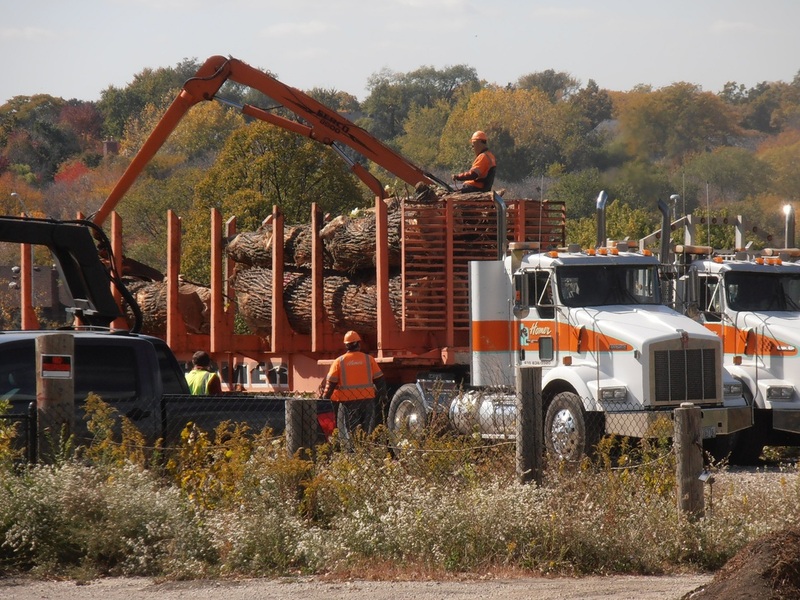 In November 2011, Openlands, the Chicago-area conservation group, made an offer to purchase the tree-lined swath of Phase II, the western half of the property, for $10 million, with the idea of eventually deeding the property over to the Cook County Forest Preserve or a similar caretaker. There were several hearings on this proposal with the Western Springs Trustees this past spring which the Patch covered. It seems that the Board of Trustees has been non-committal and unsympathetic to the sale because of the potential drop in revenue. After all, you can’t tax forest preserve land. Cut down the trees! Bring on the houses! The Trustees however blamed Openlands, stating that Openlands had not properly submitted the paperwork. Others, including Save the Timber’s Ellen Raymond and former Indian Head Park Trustee Don Hoak, have scoffed at this explanation. Last June, Openlands terminated their contract on the land. At the time, their spokesperson, Emy Brawley, said: “We’re not going anywhere and our commitment to preserve the property hasn’t wavered at all.” So, there’s still hope, but a distinct lack of progress. And the trees still fall. This week, in my research for this column, I spoke with Emy about Openlands’ continued involvement, and whether matters had changed since last June. She told me simply: “Openlands remains a willing buyer and has made inquires to determine if there's a willing seller”. Bless you, Openlands. Timber Trails Golf Course, located in unincorporated Cook County, was 105 acres of ecologically and historically significant property. 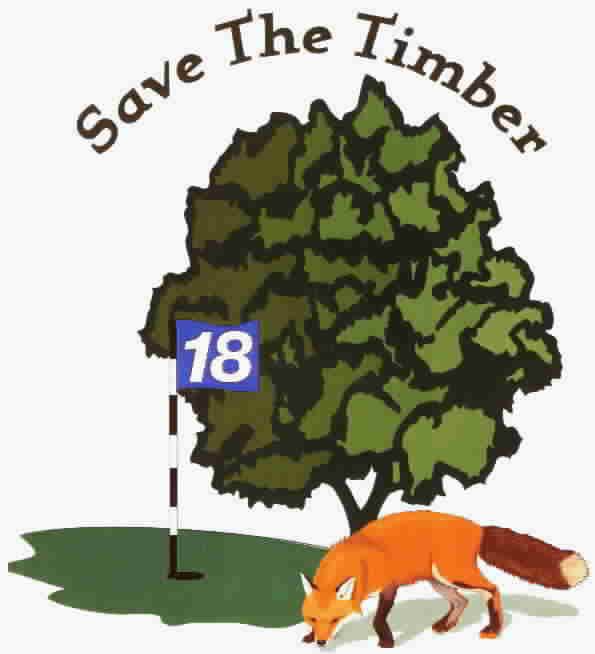 Ms. Raymond established “Save the Timbers” when she learned that the golf course was going to be sold for a 340 unit subdivision development. Ms. Raymond was tireless in her effort to preserve the land as open space. Ms. Raymond organized neighbors and worked in coalition with dozens of conservation, environmental, and historical groups, as well as with local and state officials. Ms. Raymond also spearheaded a referendum campaign that asked Lyons Township to issue bonds and use condemnation powers to preserve part of the golf course as open land. The measure passed with 52% of the vote! Unfortunately, during a delay in Lyons Township using its condemnation powers, the General Assembly amended the statute that empowered Lyons Township to use those powers. Undeterred, Ms. Raymond is continuing the struggle to preserve some of the property as open space by working with the Township to use the approved bond monies to purchase some of the property outright. In 2005, the International Society of Arboriculture bestowed its Gold Leaf Award to Save the Timber for its efforts to protect the trees at Timber Trails. The Association cited the following Save the Timber activities. -> The group proposed a conservation design as an alternative approach to development. -> Volunteers analyzed, assessed and mapped the trees on the site to inform decision makers about the nature and value of the tree resources. -> Members successfully promoted a bond issue in a November 2004 referendum to authorize acquisition of a portion of the land by the township to be preserved as a public park.